Marinara Pizza is a bright and airy spot on the Upper West Side serving up about two dozen different pies, including ones made with a cauliflower crust. The pies (square and round) include toppings like Buffalo Chicken, Eggplant Parm, Cesar Salad, BBQ Chicken and Ricotta with Sautéed Onions. 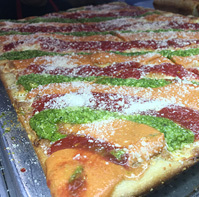 The tri-color MVP slice is topped with marinara sauce, vodka sauce and pesto. Also on the menu, Eggplant Meatballs, Sausage & Peppers, and Chicken Francese. Pasta dishes like Penne Alfredo and Bowtie Pesto are also available along with a selection of hero sandwiches.